ALBANY, NY (WSKG) – As a jury continues to deliberate in the bribery trial of Gov. 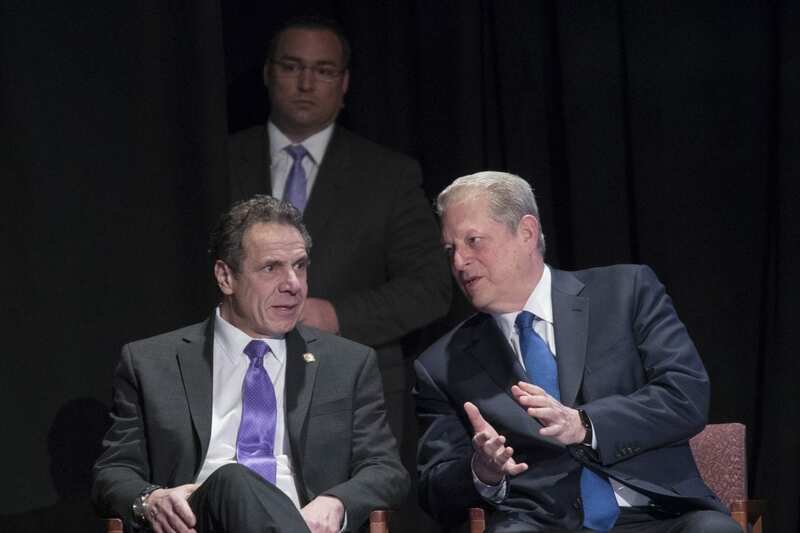 Andrew Cuomo’s former top aide, Cuomo has been keeping his focus on other matters, including appearing with former Vice President Al Gore to talk about energy and the environment. The federal corruption trial of the man often described as Cuomo’s “brother,” Joe Percoco, has exposed embarrassing revelations about the way business was conducted in Cuomo’s office. Witnesses described a pay-to-play atmosphere, where donors were given special access to the governor and his top aides, and the questionable practice of Percoco using his state offices while he was not a state employee, and instead managing the governor’s 2014 re-election campaign. Cuomo has stayed clear of discussing the trial, saying he can’t comment until it’s over. In recent days, he has scheduled some high-profile events focusing on national issues, including an event with Gore to ask that New York be excluded from the Trump administration’s expanded offshore oil and gas drilling program. The former vice president praised the governor for his “extraordinary leadership” on promoting renewable energy and fighting climate change. At the event, Cuomo made comparisons between his administration and that of President Donald Trump, saying while Trump is focusing on offshore drilling, he’s planning to build more offshore wind-generating sites. A day earlier, Cuomo held a conference call with Sen. Amy Klobuchar of Minnesota on bills to require social media sites like Facebook to disclose funders of political advertisements. Cuomo is sponsoring a New York version of a federal bill backed by Klobuchar. Cuomo’s continued criticism of Trump and Congress has fueled further speculation that New York’s governor is setting up a presidential run. Cuomo has said so far that he’s only interested in seeking a third term as governor. On that front, Cuomo is getting two potential new challengers. Republican Dutchess County Executive Marc Molinaro is gaining support among GOP county chairs around the state to be the party’s candidate for governor, and actor and political activist Cynthia Nixon is considering a primary challenge from the left. Cuomo gained some unplanned national media attention after he took a swipe at Nixon for her celebrity status. “Normally, name recognition is relevant when it has some connection to the endeavor,” said Cuomo, who added that if it’s just about name recognition, he hopes Brad Pitt, Angelina Jolie or Billy Joel do not get into the race. “That would really be a problem,” Cuomo said with a laugh. His remarks were reported in many major newspapers across the country and discussed on cable news channels. Former Syracuse Mayor Stephanie Miner also has not ruled out a potential primary challenge to Cuomo.